I recently found the most adorable T-Shirt & skirts outfit combos at a great price. I bought each of my nieces a set that came with 2 shirts and 2 skirts each. They seemed to be missing a little something. My nieces love sparkly things. 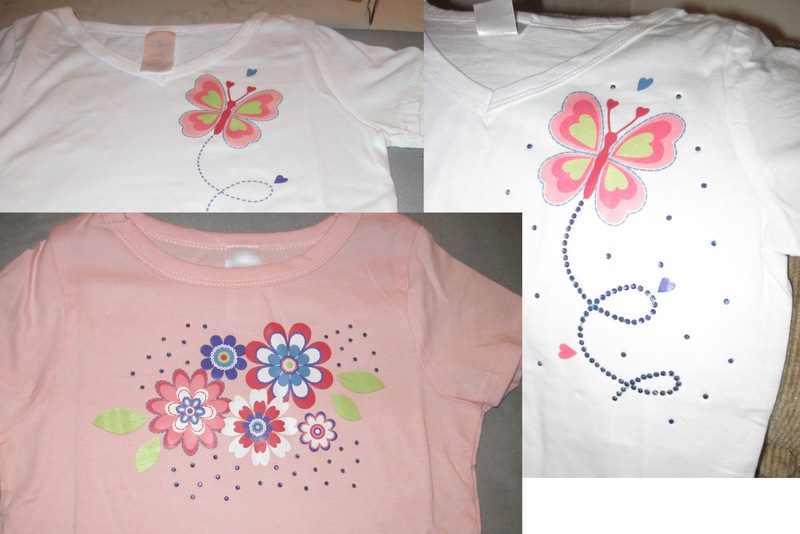 So, I added a little bling bling to each shirt with some iron on rhinestones I had. They added just the right sparkle and now I have a great sugar free Easter gift to give. The top left photo of the butterfly was before rhinestones and the right photo was after. The front pink was the second shirt in the set. It had somewhat plastic type flowers ironed on so I stayed away from that with any heat. How darling. I'm sure your nieces will love them.